Super Savings Saturday: Strawberries and whipped cream! I didn’t get a picture of all our grocery purchases this week, but I spent around $35 at Aldi and the health food store.I splurged on a beautiful bouquet of flowers priced at $3.99 at Aldi because I had a little extra grocery money. I love to buy flowers on occasion; they just spruce up the whole house it seems! My mom also found strawberries at a local store priced at $0.88 each! The cheapest I’ve ever seen strawberries here was $0.99 at Aldi, so I was pretty stoked about $0.88 strawberries! We ended up getting six containers of them and I’m going to freeze whatever we can’t eat in the next few days. After the strawberry bargain, I was especially excited to discover organic whipping cream marked down to $1.99 at the health food store. After my coupon, it was only $0.99 each–what a deal! Guess what I’m making this weekend? . Yum! I love strawberries and Organic Valley Whipping Cream-yum! I am so lucky to have a store nearby called Superstition Ranch Market that sells fruits and vegetables cheaply. I picked up 3 flats of Strawberries yesterday (24 1-lb boxes!) for $8. They were $0.33 each! And they are beautiful, ripe, and perfect. You always have to check the quality when you buy stuff from there, but these berries are better than the ones I bought from Sam’s Club recently, and that is saying something! How cool it is that you got a deal on strawberries AND whip cream! AND have enough left over for flowers! It’s “little blessings” like this that lets us know how much we are loved! Yummy!! 🙂 Our strawberries have dropped beneath $2.50 yet but I can’t wait until they do! We love strawberries mixed with baby spinach for a yummy salad. And I thought I just got a steal at $1.25 each! I just made a really great smoothie with this recipe. 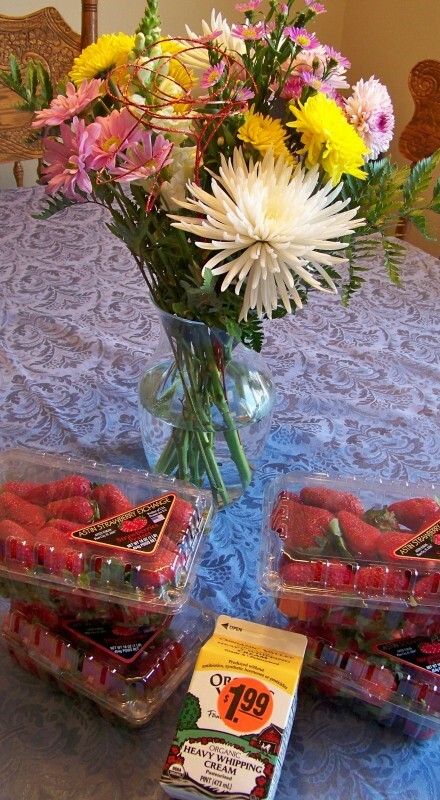 The starwberries reminded me of last year when they were (after coupons and sale) .50 at Target-remember? I ended up with both strawberries and OV whipped cream this week to. I bought a lbs for .99 at Aldi’s and used $2/2 coupon on two 1/2 pint of cream (the were $1.29 I think). I think we’ll end up just eating the strawberries and I am planning on making homemade ice cream with the cream. I read that strawberries will be cheaper this year because, due to weather, the strawberry crops in California and Florida will coincide….which means that the market will be overloaded with strawberries, therefore lowering prices. But I’ve never seen strawberries at even $0.99/package……that’s amazing. I am doing a strawberry recipe linky tomorrow! I would love to see your shortbread recipe! How do you freeze strawberries? Lots of places around here had them for $.99/lb and I am all strawberried out. This reminds me that I still need to wash/cut/freeze them today. Thanks as always for the chance to link. Strawberry prices are going low this spring because several FL farmers lost their early crops in the cold winter (hard frosts in many places in FL). For those that replanted strawberries, their crop is coming in season just as the California strawberries are, too. Lots of berries = lower prices for us! I’ve never seen strawberries for $.99! Any idea how long they would keep in the freezer? If the prices are truly going to be lower this year, I’d like to plan some space for freezing some. But I want to make sure that I don’t overbuy, even for the freezer. I’ve frozen them for up to 3 months. They usually don’t last too long in our freezer, though, since we love smoothies! Combine sugar and cornstarch and slowly stir in water. Add strawberries. Boil stirring consistently for several minutes. You can also make blueberry syrup this way. So yummy!! Thanks for the link – I shared my free shopping trip to the mall! Strawberries are only 69 cents a pound in Southern CA this week (Staters). My son says they taste better than the ones grown in FL, but I wouldn’t know, since I don’t live there. I make freezer strawberry jam…very easy. Oh, and I paid only 99 cents for heavy whipping cream, although it was not organic. I think the groceries are generally cheaper out here. I was so excited because last weekend, our Kroger had a 3 day sale on strawberries for .99 each! Plus they let people buy up to 4 containers. I got myself 2, kinda wish I would have bought more now. However I still have frozen strawberries in the freezer from the last great sale! 😀 Strawberries are something I don’t buy unless they are cheap, even though I love them! Yes, I’m also from So. Cal and got 3 lbs for 69 cents each! I’m going back to get more to freeze. Any tricks? I’ve never froze strawberry’s before. I guess this would also be the time to learn how to make strawberry jam! I love Aldi’s flower bouquets! They last for a long time, too. In the winter, I try to pick one up every few weeks just to add a touch of happy to my home. During the summer, we get plenty of homemade bouquets from the yard. Hey, I’ve been wondering about your house hunting since it’s been a few months since you met your savings goal. Have you found your dream home yet? Will you be sharing? (though I completely understand if you want to keep it private). We’ve been looking hard since the beginning of the year. We recently found one that we really liked but it’s just a tad bit out of our price range, so we’re saving up a little more and the planning to make an offer on it provided it stays on the market. We’re learning contentment and patience through this whole process, that’s for sure! Ahhhh, Crystal, I like your attitude. 🙂 If it’s meant to be yours it will wait for you. If not, there will be one you love even more when you are ready. I think you have a very sensible approach. I also think your example of how to buy a home (with cash — not a HUGE mortgage) will be inspiring to many out there. Save on, girl! Thanks for the linky as always! 88 cent strawberries! UNHEARD OF! Wow! I live in Central FL and I bought a whole flat of strawberries for $8! I gave some to the neighbors and am getting ready to freeze a lot of them. I sure hope they are cheaper! I got them for .98 the other day and got 6 containers too, it barely lasted 3 days!!! If I want to freeze any, i would have to buy alot more than that!!! = ) 4 hungry boys! !